As I child I was interested in learning how things worked. On any given day you could walk into my bedroom and find what started out to be a perfectly good transistor radio, toaster or cuckoo clock sprawled out in little pieces on my desk. I was so curious about how these things worked that I decided to go to collage and become an engineer. But it wasn’t until my senior year that my curiosity took a 180-degree turn. For you non-engineers, that means a complete turn-around. After four years of studying subjects like math, physics and thermodynamics, I had an opportunity to take an elective class on engineering management. It was the study of how to manage engineers. Not actual people of course, but engineers. Our first assignment was to read a book that was written by a Missouri farmer almost 50 years earlier. It was entitled, “How To Win Friends And Influence People” by Dale Carnegie. I couldn’t put it down. Almost overnight I became more curious about how people worked, than with how things worked. Not only did I read and re-read what Dale Carnegie taught about winning friends and influencing people, but I took it upon myself to test his techniques at every opportunity. I started by introducing myself to 10 new people everyday with the purpose of learning their name along with something interesting about them. It was not easy at first, because I didn’t know how people were going to respond to my open and inquisitive nature. What I discovered, however, was that virtually everyone I met was delighted to have an opportunity to talk about themselves. By the end of the semester I was arguably the most well known student on campus. I made more friends in three months than I made in my entire life up until that point in time, thanks to Dale Carnegie. On one particular day I counted more than 100 different students using my name when they greeted me on campus, which was a far cry from the one or two people who shouted my name just a few months earlier, and they both worked for the campus police department. What I learned from “How To Win Friends And Influence People,” was how to take my natural curiosity of wanting to understand how things worked, and use it to understand how people worked. And it was a lot more fun. Eleanor Roosevelt once wrote, “I think if a mother could ask her fairy godmother to endow her child with the most useful gift, that gift would be curiosity.” I couldn’t agree more. Curiosity is what causes us to act on our interests in the understanding of people and things. And when we do it with people, we’re offering them the rare and intangible gift of interest and understanding. We like people who find us interesting. We like people who pay attention to us. We like people who make us feel special. We like people who take the time to talk to us and try to figure us out. When you approach someone with genuine curiosity and the desire to open them up and see what’s inside, it’s easy to ask questions and generate interesting conversation. Everyone likes to talk about himself to one extent or the other. The problem is, you can take your curiosity, and questioning, too far. Even a cat approaches a window fan with caution. Not everyone is as willing to talk about different aspect of his life to the extent you are. Asking someone if they’ve ever been in jail or cheated on their spouse or a whole host of other questions should be considered off limits, at least at first. You should never ask someone something about himself if you’re not willing to answer the same question in return. And, just because you’re comfortable answering a question about a touchy subject does not mean that someone else will be comfortable answering the same question. The key is to be cautiously curious about others and to be willingly open in return. That’s the essence of great conversation and it’s one of the ways to spark likeability. The other thing to consider when demonstrating cautious curiosity with someone is to examine him or her in the same way you would examine a toaster. 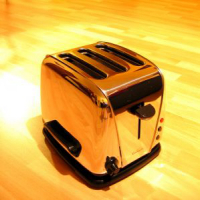 When you crack open a new toaster and try to figure out how it works, you don’t argue or disagree with it. It serves no purpose. The same is true with people. If you genuinely want to get to know someone, save the argument and start the research. The next time you meet someone, practice cautious curiosity and notice how easy the conversation flows. In doing so, you will find them half as interesting as they find you. If you are an engineer, that means they will find you twice as interesting as they would otherwise.